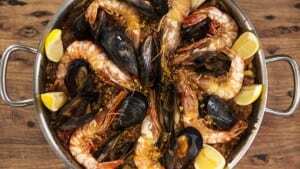 Masterchef contestant and star of TV show Everyday Gourmet, Justine Schofield has created a PARTY PAELLA recipe that is sure to get the party feeling started! 4 marylands, boned- free-range chicken, each pieces cut into 3. Place a 30cm diameter paella pan over high heat and add 80ml of the olive oil. Add the calamari and season with a good pinch of salt and pepper. Cook, stirring continuously, for 1½ -2 minutes or until firm and lightly browned. Remove from the pan, cover and set aside. Add the chicken and garlic, season with salt and pepper and cook, stirring continuously, for 5-6 minutes or until lightly browned. Push the chicken to one side, reduce the heat to medium-low, add the remaining oil, the onion, runner beans and bay leaves, season with a little salt and cook, stirring continuously, for 5 minutes or until the onion is golden. Add the capsicum and cook for 10 minutes or until soft and a jammy consistency. Mix the chicken in with the onion and capsicum. Add the grated tomato to the pan, cook for a minute then add the sherry. Increase the heat to medium-high, season with salt and pepper, and cook, stirring occasionally for 15-20 minutes, scraping the base of the pan to deglaze as the soffritto cooks. At this stage, any liquid should have reduced and the paella should look like thick, chunky jam. Add 1.3 liters of hot water, stir and continue cooking until it comes to a simmer. Return the calamari to the pan and simmer for 7 minutes. Lightly toast the saffron on medium heat in a pan, then add a few tablespoons of water, swirl and add the contents of the pan to the paella. Sprinkle in the rice and stir evenly through. Add the mussels and prawns. Do not stir again. Continue cooking for 15 minutes, then remove from the heat and cover with 2 clean tea towels. Set aside for 10 minutes to steam. Divide among plates and serve with the lemon wedges.